Lunar eclipses occur when the Earth passes between the moon and the sun. Compared to the Earth, the moon’s orbit is on the tilt, according to Josh Pritz, a Weinberg junior. As a result, the Earth’s shadow blocks the moon twice a year. During all lunar eclipses, the moon turns red. According to graduate student Cobi Rabinowitz, Earth’s atmosphere functions like a prism that filters shorter wavelengths. Blue light is blocked, and red light, which has a longer wavelength, is bent. Then, the red light is reflect onto the moon, giving it its bright color. Though the name might have attracted some visitors to the observatory, viewers missed the height of the eclipse, thanks to the Chicago winter striking again. It started snowing, and clouds blocked the moon. 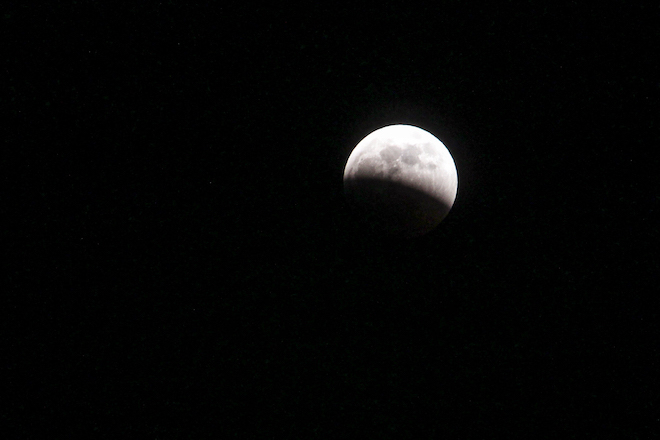 Still, a handful of students stayed, and the skies cleared up briefly, giving them a glimpse of the moon.